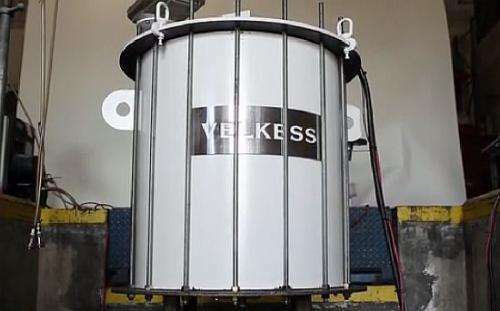 (Phys.org) —A new Kickstarter project called Velkess (Very Large Kinetic Energy Storage System) has recently gotten underway to bring an inexpensive flywheel to market. The project is headed by Bill Gray, who has taken a unique approach to flywheel design—a flexible rotor made of "E-glass," a common fiberglass used in everything from sporting goods to shower doors. Rather than use advanced carbon-fiber composites manufactured to exact tolerances, Gray's soft rotor flexes in response to destabilizing forces. It is thereby able to adjust to speed transitions that confound other designs. With the memory of other flywheel venture failures, like Beacon, fresh in mind, Gray has cast the issues a little differently. While carbon fiber reinforced polymer is 6 to 8 times stronger than E-glass, he notes that E-glass is 10 to 20 times stronger per dollar. Similarly, E-glass will store 10 to 20 times more energy per dollar. The current prototype floats on a magnetic bearing assembly that can handle 2kW of power, and store 0.5 kWh of energy. Their final device will need storage closer to 15kWh to meet the first projected 48-volt off-grid power backup. This scale up means replacing the 25lb flywheel rotor used for the video footage with a 750lb rotor. Scale-up creates new issues including special production runs for magnets able to support that load, and also equipment to safely handle all that magnetic force floating around. Details of the bearing-motor assembly are still not publicly available. Since the rotor design is essentially cantilevered from the motor in the vertical plane, anything here is possible. For example it appears that the rotor has a low-end speed of 9000 RPM. That would be where it is not even transitioning power. To get to the 15kWh regime, we are probably talking about a max RPM on the order of that of a jet engine. Jet engine speeds are well above even the fastest comparable electric motor speeds. For example, high-speed spindles for machine tools, that might put out anything approaching say 30kW, would probably max out below 10,000 RPM—and these motors can cost over $50,000. Probably some fancy gearing is involved here, and therefore ample opportunity for unique combinations of bearings to be employed throughout the system. Where mechanical bearings are to be used, they can have thermal sensors to detect any rise in temperature that would indicate a failure may be about to occur. The possibility for catastrophe due to fracture in one of the silicon nitride bearings can be therefore be greatly reduced. In an off-grid shutdown, the device would dissipate its energy in the form of exhausted hot air. As the rotor slowed over the course of ten hours, this would be a similar flow as a 1500-watt hair dryer might put out. Gray expects the final units to be comparable in price to lead acid batteries while having a much improved lifetime. Also, the construction materials will be environmentally friendly. The rotor will operate in a vacuum and it is expected that only about 2 percent of its stored power will be lost to friction each day. These numbers make the new flywheel design look like it could be a viable alternative not just to batteries but also to other green schemes like compressed air storage, or pumping water uphill. If the Velkess project can get backing on a scale similar to what these technologies have attracted, flywheels may have finally come of age. Flywheel storage is ideal for use in rail transit systems. Flywheels can be buried at the stations and spun up with regenerative braking of the trains. When the train leaves, the flywheel provides the power surge needed for acceleration. Short cycle times and high power densities are more important in this application than energy density and long-term losses. A 15 kWh storage with far better performances can be build now with ultracapacitors, and it will costs below 100,000 $. I heard of flywheels storage a long time ago, and nobody has ever built a practical (and economic) device with this technology. I think nobody ever will. I'm a bit confused by this article... why do they need to have gears or a physically contacting motor at all? Why not just use a frequency locked motor, with the whole assembly floating in the vacuum? Then you could spin the thing up to whatever speed you wanted. Good question, maybe they do. As mentioned no details on that. However for a motor / generator of any appreciable size, 60,000 RPM would be a tall order. A small, slow motor, with a gearbox could still spin up the flywheel, but to take significant power off and convert it to electricity with rotating machinery you would want the generator aspect to be fairly large I would guess. While the first application envisioned here may not be large power handling, myself and other commenters here offer that this is the regime where flywheels have traditionally shined. However for a motor / generator of any appreciable size, 60,000 RPM would be a tall order. Just in case you misunderstood what I said, I'm wondering why they don't just put some magnets around the edges of the flywheel, levitate it in a vacuum, and spin it up using a rotating magnetic field. The flywheel could be stabilized by inductive damping, and the RPMs would simply accelerate to match the oscillation frequency of whatever circuit you used to drive it. The only limit on the rotational speed would be the bursting strength of the flywheel. flywheels are q past technology resurrected at the wrong time. a new day for flywheels will be born only when sueperconducting floating magnet systems with induction charging and discharging are already cheap and affordable. furthermore hyperstrong materials of the future will have to be imvented to handle the rpms necessary to make flywheels effective at storing significant charge in a small space. the cost efficiency approach of this kickstarter is enviable but instead of innovating through the issue the design engineering here chose the cost effective simple technology. this approach will not be competitive with expected improvements in lithium ion batteries. Because the sucker is 750 pounds. If you want to levitate that with permanent magnets (at an appreciable price): good luck. You'd need to stabilize it actively (which would draw power), as any kind of shift/imbalance would effectively mean a 15kWh bomb going off in your basement (which is about 11kg of TNT worth of energy...so quite a bang...plus the implosion from a sizeable vacuum chamber). Rotating masses are pretty stable, but a minor earthquake could really mess things up in your neighborhood if people had these routinely installed. This may be good for stationary use, but spinning flywheels are extremely difficult to move, this could never be used in cars for example. Don't some turbines use superconducting magnetic bearings or am I mistaking something I heard being researched with something having been announced? Anyway... I hope that was a bit of promotional theatre where he described how he was inspired by his observation that we need improved methods of energy storage. Even many people who don't think highly of renewables and alternatives would see a use for distributed storage capacity to cover emergencies like outages or to smooth the cost of peak time power consumption by storing off peak production. It's like saying, "I asked myself why so much demand exists for water, even at the coasts. I came up with a brilliant observation that cheaper methods of desalination would be wonderful." > Details of the bearing-motor assembly are still not publicly available. That makes the whole thing difficult to assess, let alone support. this could never be used in cars for example. Some trucks use flywheels to store breaking energy for acceleration. Switzerland experimented in the 50s with running entire buslines with Gyrobusses. During the 2009 season some Formula 1 cars had flywheels on board as their KERS (kinetic energy recovery system). The teams that had those have since then switched to batteries and e-motor KERS like all the others. We have synchrotron magnets lying around in my office that can lift at least a few hundred pounds, and I don't think they cost too much. Which is why I suggested inductive stabilization. You just set up a magnetic field so that any instability generates eddy currents in the disk, which bleeds off the vibration/shifting. For something rotating at over 10,000 rpm, you could easily generate thousands of pounds of force this way. How is this any different than what Beacon Power is doing? @Elder1: An ups is NOT an energy storage system! It stores small amount of energy and release it in emergencies, but it is designed to stay 99.99% of the time connected to the grid. Charge/discharge efficiency or self-discharge rate are not important for it. Please compare the cost per kWh (NOT kVA!) of a flywell system with a lead battery and reconsider your post. So what is new about this? Nothing that is stated goes beyond a Scientific American article I read 50 years ago. In fact what is stated stops well short of it. I wouldn't invest a red cent in this from what he is willing to disclose. "Gray's soft rotor flexes in response to destabilizing forces. It is thereby able to adjust to speed transitions that confound other designs." -You would need a hard connection for rapid changes in speed. Perhaps these guys haven't gone bankrupt yet? It's interesting that this guy has come up with a cheaper solution, but this article fails to touch on how strong this new material really is; how long it will last; is it really "10 to 20 times stronger per dollar" or is that only Bill Gray's statement? Bankruptcy doesn't equal "out of business". I drove by Beacon Power the other day and the looked like they were still in business. All of the ones I have store energy for a rainy day. My God! A whole rainy day? Are you sure? The 15 kWh beast presented here will have a 750 lb flywell, and 15 kWh are not enought for a day even for the smallest data center. What the hell of flywells do you have? Or maybe you use the ups just for your desk lamp? A lot of time and money has been expended to find the "sweet spot"
While you keep wasting your money in search of the sweet spot, please answer my previous question. How much does it cost per kWh your fabulous flywell? Glass fiber is about 50% of the strength of carbon fiber composite. Carbon is far stiffer but not much stronger. The stresses on the rotor are proportional to the square of the frequency, which is why it cannot spin up to turbine RPM's. BMW was building a flywheel hybrid vehicle, but the engineer made an error, broke it, and it actually decapitated him, threw a scare into the auto industry. how about a flywhleel that is made of materials (possibly thin film sandwiches) that would make it possible not only to store the kinetic energy but make it a solid state battery at the same time, solid state batteries are known for their high energy density, but low power density, while flywheel has this immediate peak oomph. @Husky: There is a much simpler way, already in production now: add an ultracapacitor to a lithium battery. I like the idea of the maglev angle (mentioned by Elder1) as the solution to at least most of the rotational force, as the flywheel spins inside a repulsive magnetic channel. This would neutralize the centripetal stress component, leaving only the torsional component to be dealt with- for spin-up to large rpms. Ignorance is bliss apparently, have you not heard of KERS used rather successfully in Formula 1 then ? And I'm sure you will see they are not only easy to move but handle rather significant G forces on turns, accel and de-accel...! You (and english Wikipedia) have rather old informations, F1 Kers systems are all electric now. Check the italian Wikipedia page. Its not odd at all, notice the link is in respect (also) of what had gone before, this clearly points out the flywheel systems have been around more than long enough for Judgeking had he taken the trouble to check any time in the last 3 or 4 years or so. I really think that Wikipedia is a sort of miracle, one of the most accurate enciclopediae despite the young age, and is one of my favourite sites too. Anyway, " Quandoque bonus dormitat Homerus" (if you don't know what it means seek for it in Wikipedia). If you, or Wikipedia, or God Himself states something wrong, I think I should, whithout offending anybody, correct him. About flywells: You are right, they where used in Kers systems in (if I remember right) one F1 team, but all the others choosed the electric system, and nowaday nobody uses flywells anymore. There was no problem whit shakes and accelerations becouse: 1) they used not one, but two coaxial and counter-rotating flywells and 2) the energy needed was very little: Maximum 400 kJ, about 0,111... kWh. If somebody would scale the system to the 16.5 kWh of a Chevy Volt, he's surely looking for trouble. P.p.s I am not a dog, who says that I bark should be a complete idiot. Very promising. I hope the promise is delivered. I have a question about stationary flywheels for electricity grid storage, it seems like if you make them very large diameter, you decrease the rotational stress per unit of energy stored if I remember physics of angular momentum and energy correctly. Why would you not make something like a 6 meter diameter pancake for the flywheel for best strength vs energy over a 1 meter diameter design in the picture? Also just burying them underground should work for cost effective safety and is cheep right? I think even 11kg of dynamite worth of energy doesn't do to much damage if it's in a vacum filled 20 foot room that is also 20 feet underground and located in an empty field next to the transformer towers running electric lines. Because it sags at low speed (or when stationary) - which eventually will cause the wheel to break (and that probably when under stress - i.e. when spun up - which is not a pretty picture). No, but if you have to bury it deep then we're no longer talking 'cheap' nor 'deployable everywhere' (certainly no longer deployable in cities). @Guy_Underbridge: Inconsistent? I don't think so. The article we are commenting is about energy storage. An energy storage should contain a lot of energy and should be designed to store and release it at will, like, for instance, the pumped-storage hydroelectric dams. A big flywell system like the ones you saw in Paris can surely give out a lot of power, but for a small time, until the diesel generators kicks in. That equals to a small energy the flywell has to store (power * time = energy). Unfortunately today it costs less to produce energy (at least, for emergencies) then to store it. You should also consider the self-discharge rate and the charge-discharge efficiency, quite important features for an energy storage but not for an ups system like the flywells. One should note that the power-needs of a UPS is somewhat different in different parts of the world. For critical systems (like hospitals) they just need to bridge the time until the generators kick in. For data centers only until the data center can shut down in an ordered manner. Also note that power outages in Europe are pretty rare and usually on the order of seconds (to a few hours at worst) - not days. Clever idea! Like an electrochemical wind-up spring. :-) Spin it to charge it, and it'll un-spin to discharge. "store 0.5 kWh of energy" or 1.8 megajoule. Not much. How does that compare with modern supercapacitors of similar cost? And how does speed of charging compare with those? The article could have more details. In my experience a flywheel energy system is used as a TRANSITIONAL device from one power source to another. One example is upon the loss of AC line power, the system instantly switches to flywheel power and a generator autostarts, comes up to speed, stabilizes, and then takes over before the flywheel spins down and its output energy drops below a certain threshold. The flywheel is basically a UPS system without batteries. Depending on the wheel kinetic energy and the KW of the system it has to power, the flywheel can generate energy from 15 seconds to a few minutes. Or even longer under less load. I've seen some large ones for broadcast stations rated for 15 minutes. Over the long run, flywheels are cheaper than battery UPS and much better for the environment - if it is in a transitional power type of setup. store 0.5 kWh of energy" or 1.8 megajoule. Not much. How does that compare with modern supercapacitors of similar cost? Supercapacitors aren't good at retaining a charge/energy (in contrast to flywheels which can be kept spinning a long time without much loss), so they are useful in different scenarios. Research values for carbon aerogel or graphene supercaps are at the 90Wh per kg range. Also note that that amouint of supercaps would be quite expensive. Regular turbochargers found in cars can easily get to 150,000rpm. Which leads to the exhaust gas of a large refinery or similar factory which emits large amounts of gases being used to spool up something similar to a turbocharger to drive the flywheel. Of course it would need a way to overcome the initial inertia if it is stopped, but if it is designed correctly a long breaker bar could probably turn it by hand(since the bearings would be smooth enough to turn by even the weakest hands, to reduce losses etc). Then it's just a simply matter of keeping a constant stream of gas flowing to the turbine portion of it, and a simple gearing system at the other end to drive a generator/dynamo. @Guy_Underbridge: Inconsistent? I don't think so. The article we are commenting is about energy storage. An energy storage should contain a lot of energy and should be designed to store and release it at will. Since when did energy storage systems have to store X amount of energy to earn such a title ??? Yes, tiny batteries and pumping storage dams are energy storage systems, like your desk drawer and a big warehouse are things storage systems, but there is some difference, don't you think so? I was pointing the difference between UPSes and energy storage systems, not only the energy but the capability to store and release energy as a daily duty or as a emergency one.